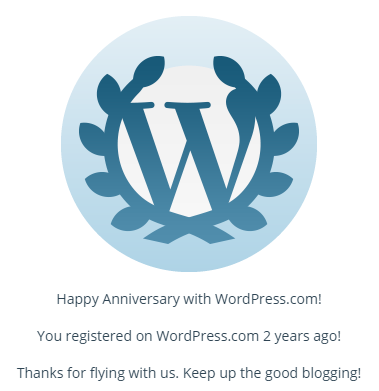 2 Years of Blogging! Happy Anniversary! IT’S BEEN 2 YEARS! I’m so happy about this, I can’t even find the proper words. Thank you to everyone who’s visited/commented/liked/followed this blog, whether you came here on purpose or stumbled upon it somewhere in the depths of the interwebs! A lot has changed since last year (which you can check out in detail here) and I want to share those accomplishments with you! The total views of the blog amounted up to 32,702. We’re up to more than 115 followers on the blog itself, 63 people on Twitter and 126 people on Facebook. You go people! This will be post #193! The Top Comments are no longer exclusively on Doctor Who posts, but all sorts of topics such as Teen Wolf, Finding Carter, Lust for Love and many more. If you want to know anything else, please don’t hesitate to ask! I’m concluding this with another THANK YOU! Keep reading the blog, keep commenting and liking to make it many more great years to come! Congratulations on the 2-year mark. That’s quite the accomplishment. Keep it up! Thank you :D! I very much intend to! Thank you 🙂 the time goes by so fast! It does! Isn’t it something like “time goes by when you’re having fun”? That’s so true! Being on WordPress is so much fun and everyone is just so nice. I spend way too much time on here. I guess you are right about that as well! I want to thank YOUR for providing me/us with all this great sources of how to pass my/our free time. I don’t know what I would do without your blog! You’re totally exaggerating 😛 but thank you! I appreciate it a lot! I know I’m late to this, but congrats on this milestone.